Started in 1983, the Small Project Assistance (SPA) Program represents the largest and longest-running partnership between United States Agency for International Development (USAID) and the Peace Corps. Since 2000, nearly $44 million in USAID funds have enabled the SPA Program to support life-changing projects around the world. SPA grant projects have generated an additional $34 million in local community and third party contributions. There are three components to the SPA Program: Grant projects, training activities, and field-level program support. Grant projects, which are the most widely-used component of the SPA Program, enable Volunteers and community counterparts to implement community-led development interventions. Training activities allow Volunteers and their local counterparts to build capacity by gaining technical skills for wider development activities. Field-level program support enables Peace Corps posts to invest in, provide technical assistance to, and learn from their local SPA programs. SPA grant projects and technical trainings provide valuable skills and knowledge transfer that empower communities to find innovative, local solutions to their development needs. In an average year, over 275,000 community members participate as stakeholders in more than 500 SPA grant projects. Through the SPA Program, USAID resources combine with the Peace Corps’ reach, scale, and local community interaction to catalyze community-led development. 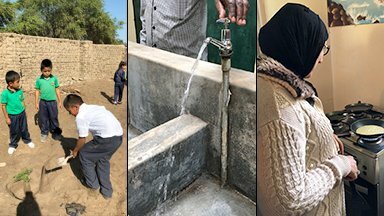 Often, communities continue to independently maintain or expand SPA grant projects even after the grants have ended, reaffirming the program's long-term, sustainable impact in communities around the world. This publication was produced at the request of USAID and Peace Corps. It was prepared independently by General Dynamics Information Technology. USAID and Peace Corps partnered to jointly fund and implement an external evaluation of the grants portion of the SPA IV Program from FY13-17, and the results are very encouraging. Peace Corps is rarely able to collect such detailed info about Volunteer projects after Peace Corps Volunteers leave their sites, and the evaluators were able to visit communities years later to see the long-term effects of grant projects and discuss them in detail with community members. This evaluation is a great opportunity for us to use a data-driven approach to learn more about our Small Grants Program and improve upon how we are empowering communities to lead in their own development. 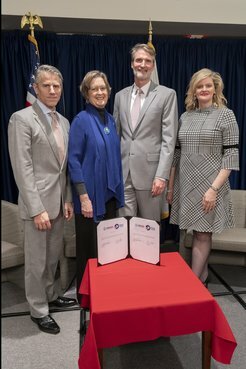 Peace Corps and USAID hosted an event at Peace Corps’ Shriver Hall on November 26, 2018, to celebrate the success of the SPA program and the continuation of our inter-agency collaboration.